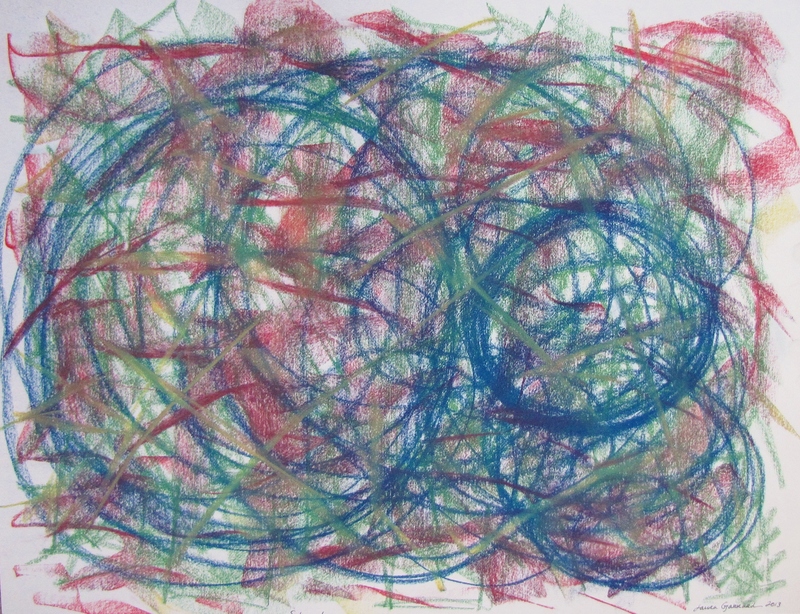 This is my own exploration of emotion through internal, intuitive abstract processing, as taught to students in my art class “Express From Within: An Energy Art Class.” I begin with a light energy meditation. 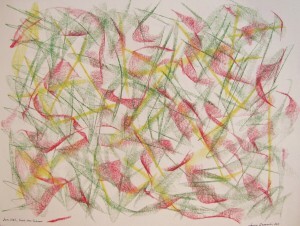 Then I intuitively and spontaneously choose an emotion or emotions to express. 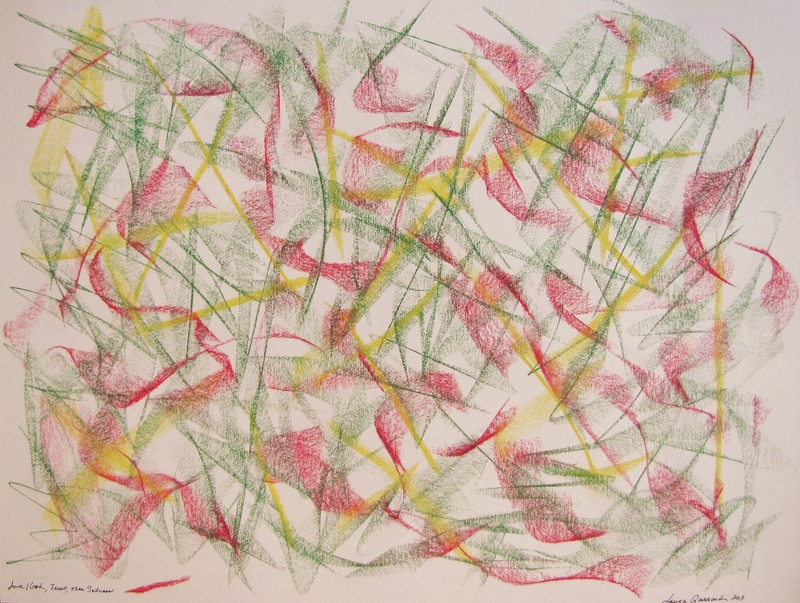 I select a spiritually inspired color and mark to use with each emotion and then express on paper quickly in abstract form. I am finding that the less desired emotions (the ones we try to avoid or don’t like to think we have) create dynamic and beautiful pieces! 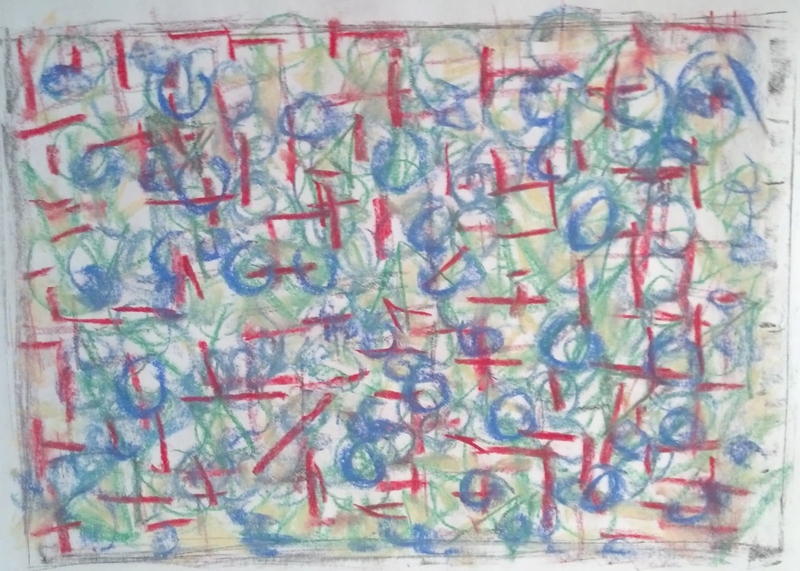 I find it liberating to express safely those very human emotions, letting them flow, and understanding their purpose, how and why they are in my experience. 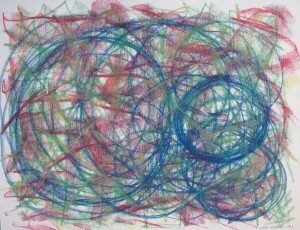 During the creation of these pieces, thoughts come forward and present realizations about these emotions and myself. It assists in processing and moving past personal blocks. 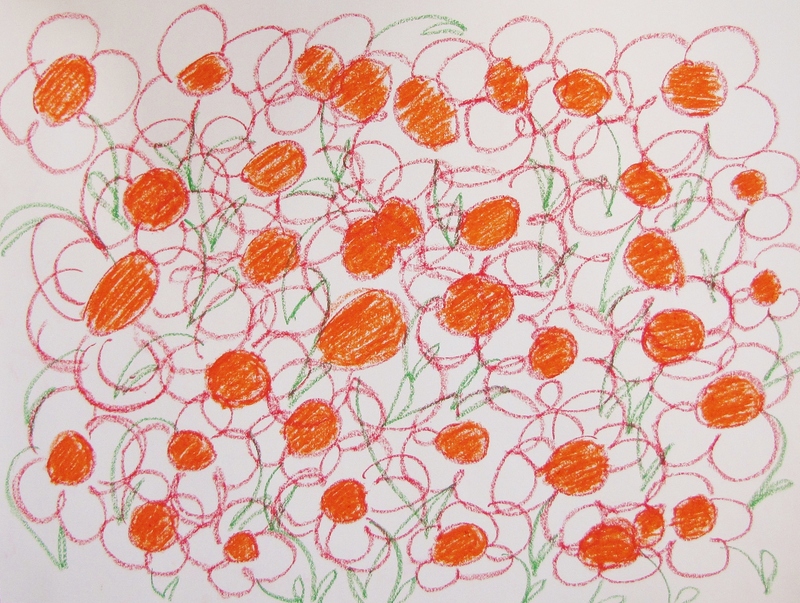 Writing in an art journal follows to capture these processes, thoughts and realizations so that growth may take place. I invite you to try this in your life! 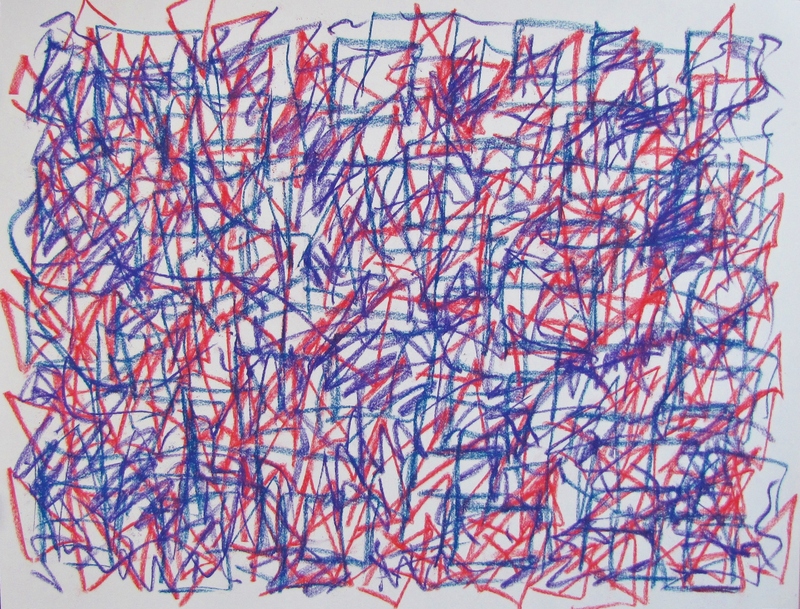 For my first abstract, I chose to express the emotions of Hate, Judging, Sneaky and Irritable. 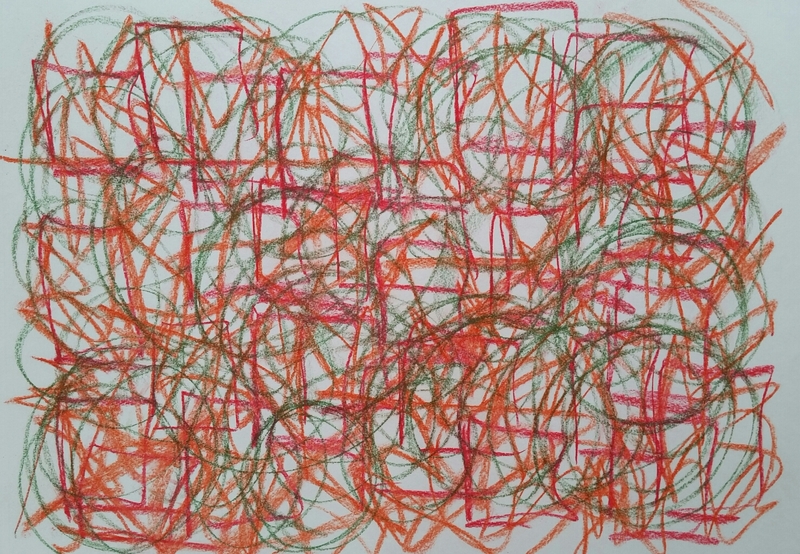 I decided to express Hate further in my second piece, and included Dislike, which differed from Hate in that it is a decision to dislike unlike the spontaneous emotion that is hate. Therefore, Dislike can be considered Retaliation or Rebellion. After finishing Hate combined with Dislike, I was invited to explore Happy and Joy. I found myself becoming hesitant and trying too hard with Happy and Joy – like if I weren’t careful, it would pass away. 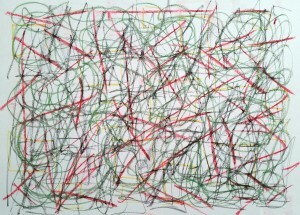 In subsequent meditation, I was inspired to try again, but instead using black only, then working back to color. 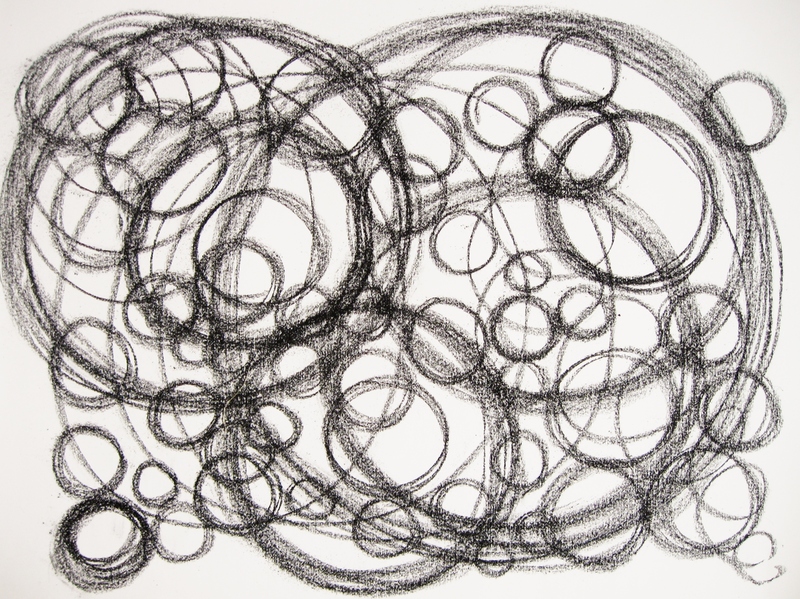 My further exploration of happy and joy in black and white circles. 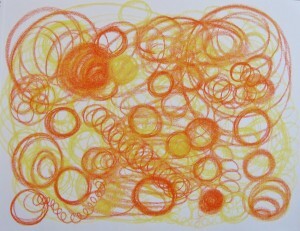 I was encouraged to draw large and small circles. 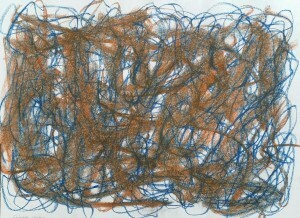 This attempt felt more spontaneous and less hesitant. It did bring on a youthful freedom. 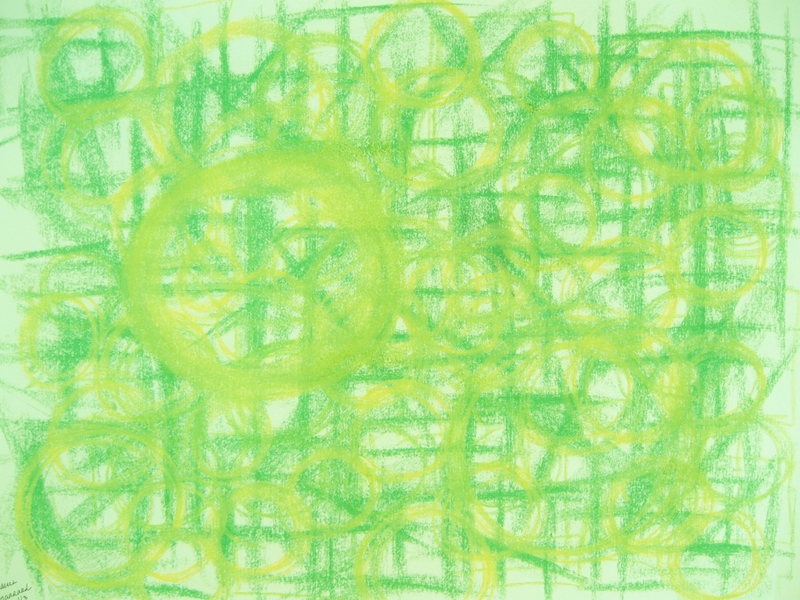 I chose to combine envy with happiness in this composition, the yellow circles serving to break through the lines/emotions related to the sadness that comes from wanting what others seem to have so readily. 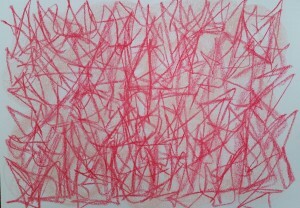 The next four abstracts are part of the same progression. 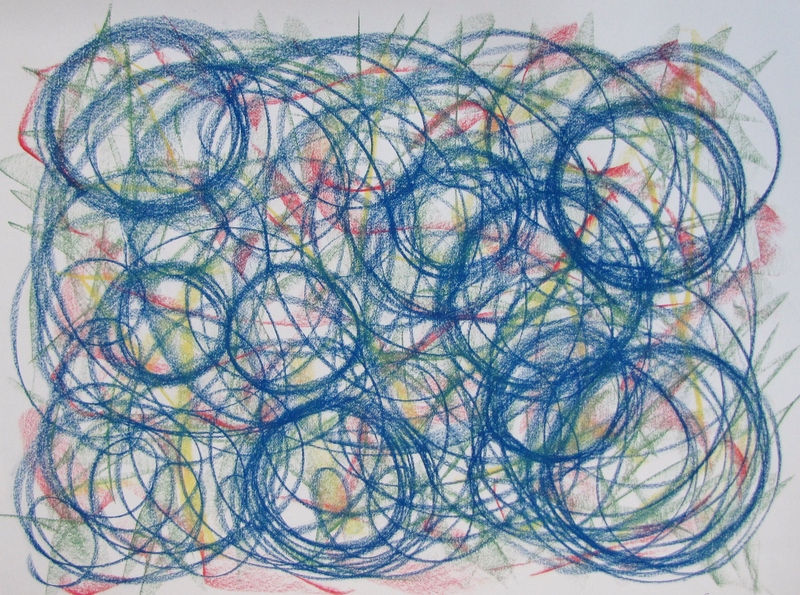 In this first one, I expressed sadness over loss of my Hannah dog in green zigzags, followed by happiness in blue circles, trust and spontaneity in red curvy strokes, and yellow lines representing God and love cutting through. The result is heavy, haphazard. So I began this time with Love and Trust as my base. This design alone is beautiful in its light simplicity! 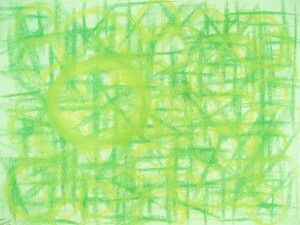 Then I added Sadness in green, which added additional interest and beauty. 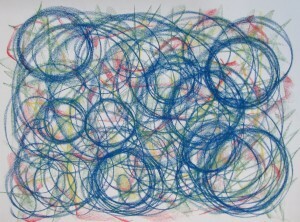 And finally, Happiness in blue circles on top. This layering produced a lighter more beautiful composition. When love and trust are present at our core then sadness does not overwhelm, nor does happiness. With love and trust as our support, emotions are more clear and don’t produce a heavy heart; they have their place but they don’t overwhelm life or the being-ness much deeper. 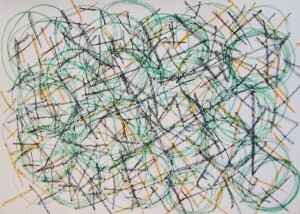 This piece represents my indifference (black and orange lines) and uncertainty (green circles) regarding my art path. At this point in time, I’m uncertain where it is going. 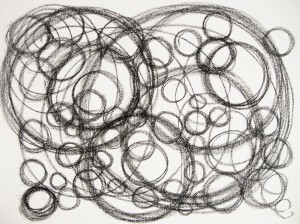 I’m uncertain of what I want to create. 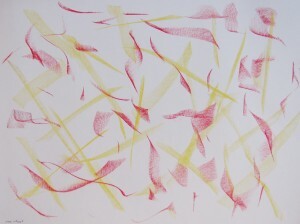 As I created the slashes, I realized that my indifference was really contentment, a new place for my heart. 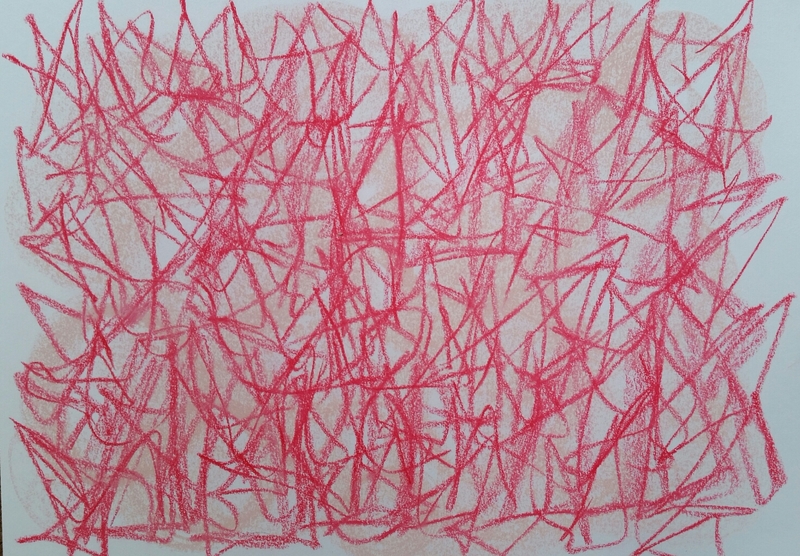 Artwork often comes from my unrest, an unsettled state. As I am recently married, I am not sure what place art will have. What will be my muse? 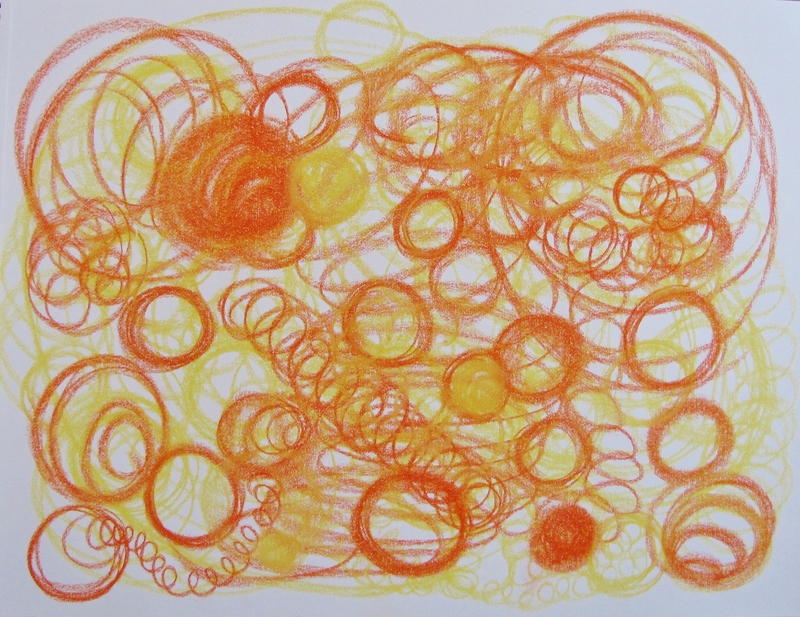 As I drew orange lines, I began to feel more joy in the not knowing. 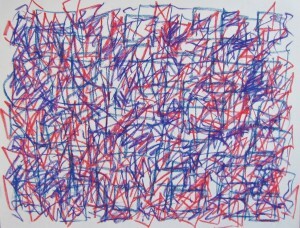 Still, what will I create after these emotional abstracts? I then felt that I needed to address the sadness and stress I seemed to be carrying following my dog’s death. 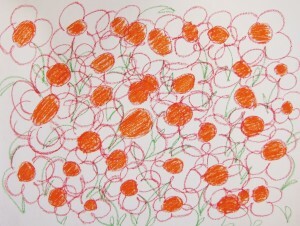 Red flowers expressed stress; the orange centers, sadness. There was just no way for Hannah’s heart to express anything but happiness, and so flowers during my sadness. I realized that my stress over not knowing what to do came from the lack of my ability to care for her, pet her, walk her, be her mom. 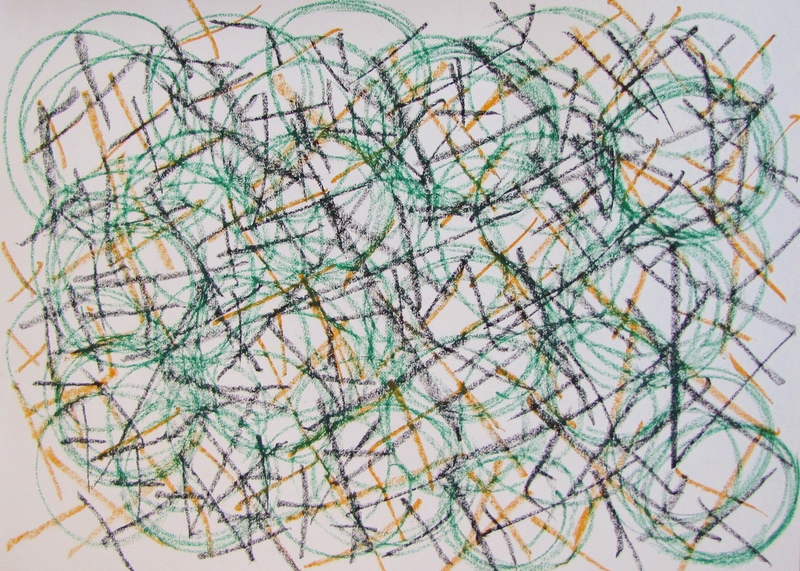 I drew green stems on the flowers for growth, for her, for connection and nourishment. I don’t have to forget my friend. The next series of four expressions reveal further letting go as I grieved the loss of my dog Hannah. Due to the timing of her passing, directly following my honeymoon, my feelings were conflicted in celebration and sadness. Busyness followed, and so my grief was somewhat stunted. These came two years later! 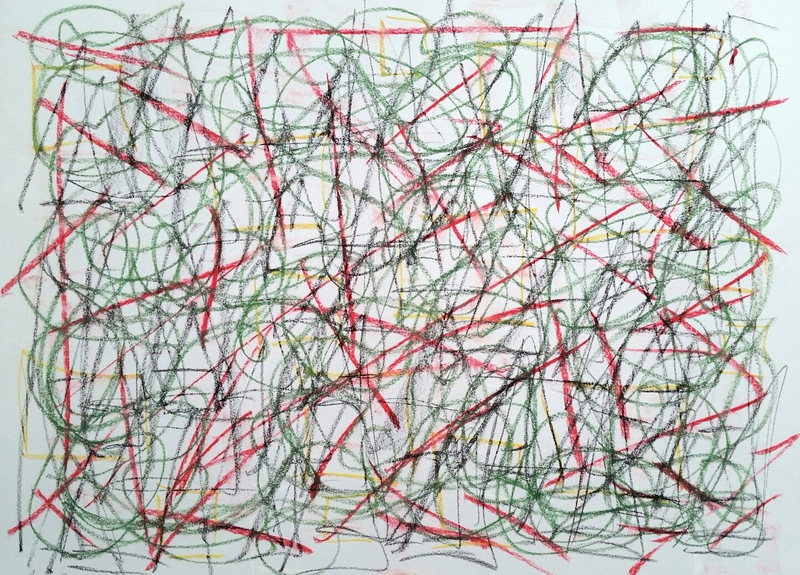 The first represents Sadness (black triangles), Guilt (yellow and white squares), Happiness (red lines) and Confusion (green circles or spirals). Hannah and I had a special bond. I didn’t get to quite finish our relationship before moving forward into marriage. I felt irrational guilt over putting her down. Yet, I needed to move on to love and trust within my marriage, and so Hannah exited as she should have. It’s scary to trust someone new with our whole heart. Thanks Hannah, for teaching me complete trust and love of another being! 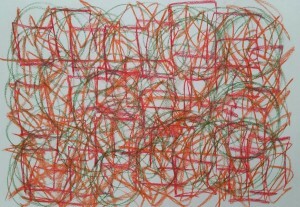 The second of the series is Fear (red line and square), Trust (orange zigzag), and Love (green circles). The previous expression taught that love can bring peace to conflicting emotions. Love can smooth the jagged and blocks and help release us from the past. 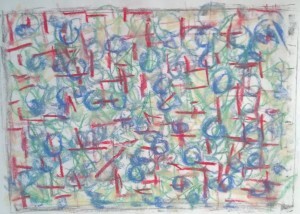 This next piece is Peaceful (beige circles) and Love (red triangles) and assisted me in feeling more love. 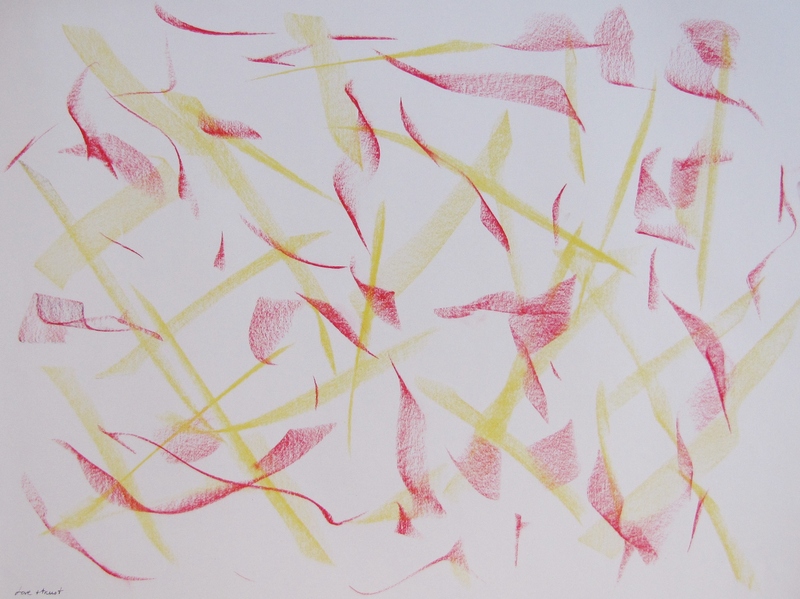 Expressing these emotions opened my heart and rested my body after the first two expressions. Underlying the sad feelings are frenzied unnamed feelings, the kind that make you want to yell, curse, beat on something. So when sadness can be fully felt and soothed, the deeper, darker emotions can release: frustrated, misplaced anger that if not released can reside within and cause more confusion and physical harm. 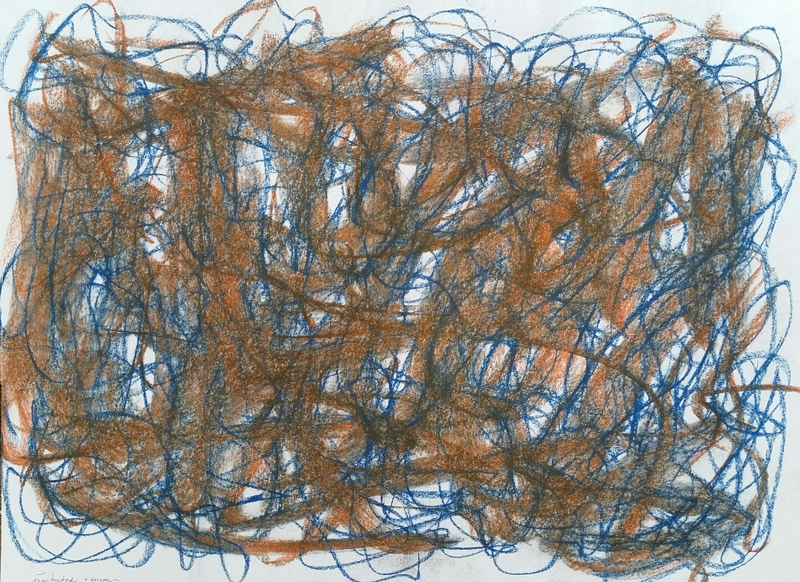 Expressing Frustration (blue) and Anger (orange) allowed me to better accept Hannah now as spirit in my experience. She’s with me all the time and will continue to love me in her sweetness until we’re reunited once more. Is this the end of this grieving expressionism? For now. I can always revisit this process if I need to.